This is the final part of the Star. 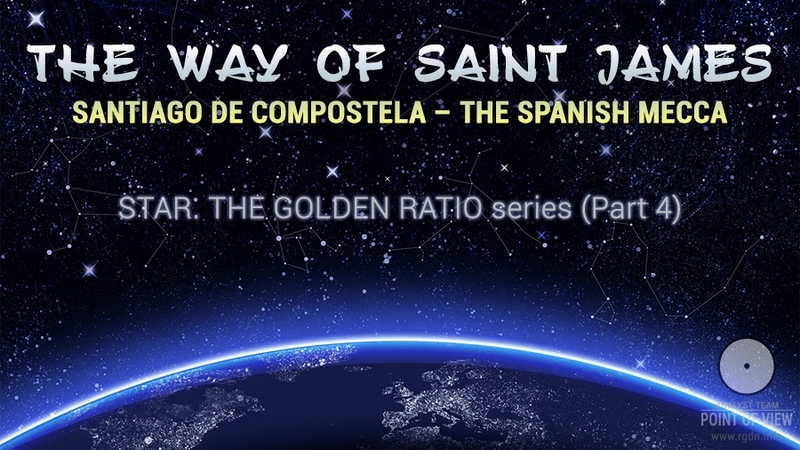 The Golden Ratio series. Here I will consider the works by Jim Alison on the patterns of cult sites placement on our planet. 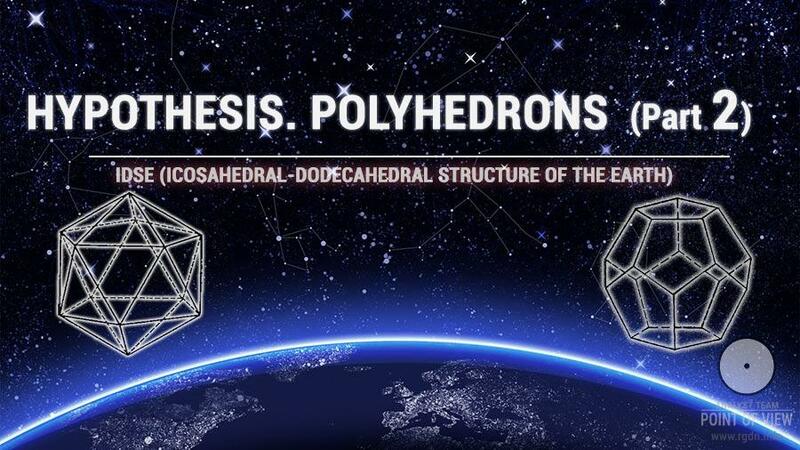 “A new look at an old design”: this is, so to say, an updated view of the ley line theory initially developed by Alfred Watkins, which I wrote about in Part 3. However, taking into account which exactly cult sites Alison considers, this is indeed another look at a very old design that, I believe, relates to the “Star Map”. I shall endeavour to simplify the material a little bit by abridging the contents, excluding tables and some calculations. Visual materials that remain are quite easy to understand. 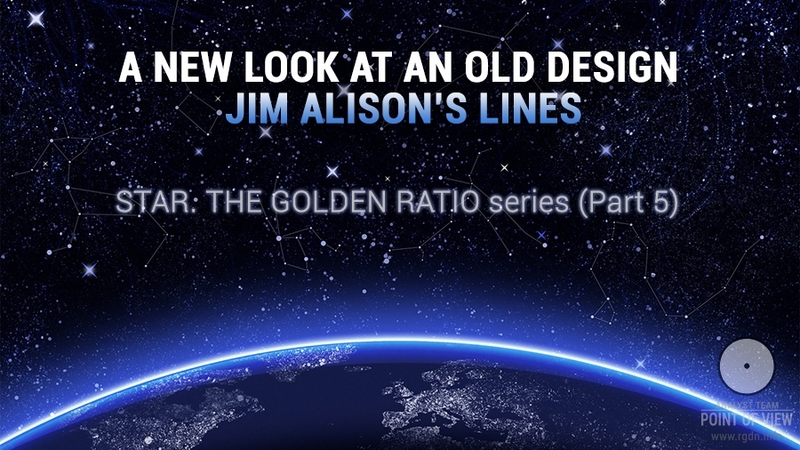 As for those who’d like to familiarize themselves with Alison’s works at great length, the original information in English may be found on the official website of Graham Hancock – the author whom you already know very well from my earlier articles The revealed secrets of Angkor and Giza plateau – the pendulum of Orion and Draco. Apocalypse now? and New evidence of the probable global disaster. Via the second of the three above links, for better visualization you can use the interactive map. Since questions arose regarding the point opposite to Easter Island, let me mention the opposite point is called the antipodal point. On the interactive map we can clearly see where the antipode of Easter Island is located. Now let’s move to the lines (alignments) considered by Jim Alison. Easter Island, Nazca, Ollantaytambo, Paratoari, Tassili n'Ajjer andGiza are all aligned on a single great circle. Additional ancient sites that are located within one tenth of one degree (10-15 km) of this great circle include Petra; Perseopolis; Khajuraho; Pyay, Sukothai, and Anatom Island. Near Ollantaytambo, Machupicchu and Cuzco are within one quarter of a degree. The Oracle at Siwa in the western Egyptian desert is within one quarter of a degree. In the IndusValley, Mohenjo Daro and Ganweriwala are within one quarter of a degree. The ancient Sumerian city of Ur and Angkor temples in Cambodia and Thailand are within one degree of the great circle. 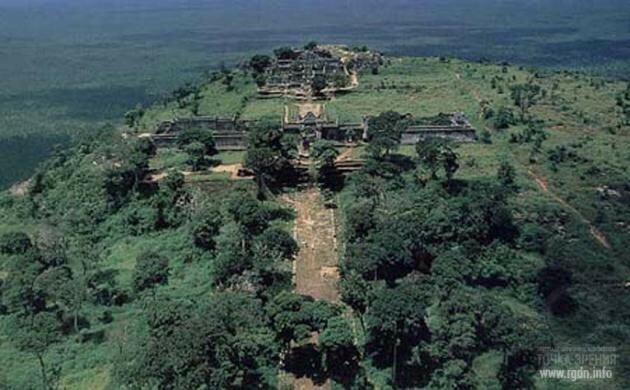 The Angkor temple at Preah Vihear is within one quarter of a degree. 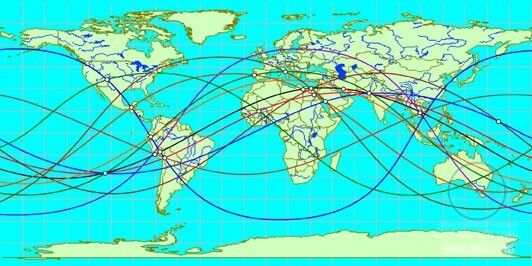 The alignment of these sites is easily observable on a globe of the Earth with a horizon ring. Aligning any two of these sites on the horizon ring (e.g. 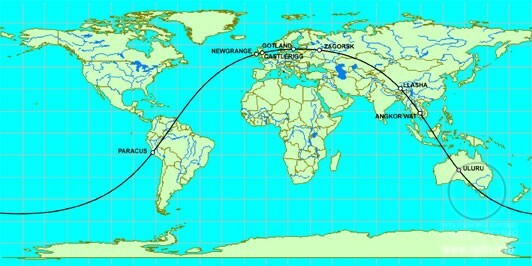 Easter Island and Giza) will align all of these sites on the ring. THE SECOND EASTER ISLAND ALIGNMENT includes the sites: Tiahuanaco, Bandiagara, Dendera, Luxor, Mohenjo Daro, Varanasi, Bodh Gaya, and Mandalay. THE THIRD EASTER ISLAND ALIGNMENT includes the sites: Fatima, Filitosa, Rome, Constantinople, Hattusas, Van, Mehrgarh, Mohenjo Daro, and Bali. 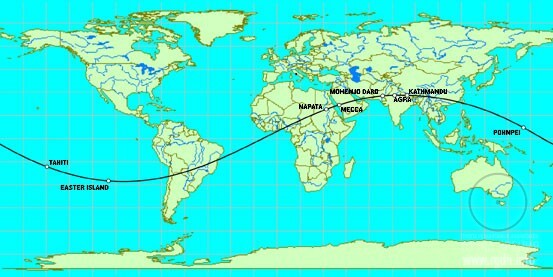 THE FOURTH EASTER ISLAND ALIGNMENT includes the sites: Napata, Mecca, Mohenjo Daro, Agra, Kathmandu, Pohnpei (Ponape), and Tahiti. THE SECOND GREAT PYRAMID ALIGNMENT includes the sites: Jerusalem, Xian, and Pohnpei. THE THIRD GREAT PYRAMID ALIGNMENT includes the sites: La Quemada, Poverty Point, Serpent Mound, Brittany, Rome, Alexandria, Mecca, and Marib. THE SECOND ANGKOR ALIGNMENT includes the sites: Paracus, Newgrange, Castlerigg, Gotland, Zagorsk, Lhasa, Phimai, and Uluru. 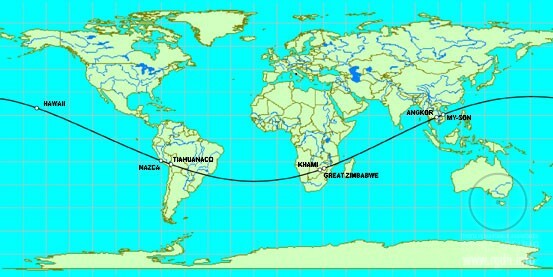 THE SECOND NAZCA ALIGNMENT includes the sites: Tiahuanaco, Khami, Great Zimbabwe, Angkor, Preah Vihear, My Son, and Hawaii. CONVERGENT ALIGNMENTS include: Easter Island, ChacoCanyon, Palenque, Ingapirca, Nazca, Ollantaytambo, Bandiagara, Fatima, Rome, Siwa, Giza, Luxor, Mecca, Persepolis, Mohenjo Daro, Angkor, and Pohnpei. Alison admits Nazca lines may be a sort of a map of locations of ancient sites. 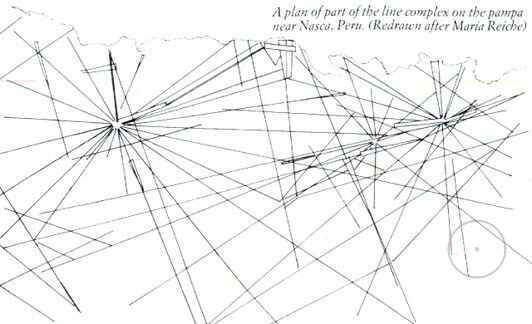 The visual similarity between alignments of ancient sites around the world and the Nazca lines suggests that Nazca may be an ancient map of the alignments of world wonders. The following illustrations are 3-D representations of the alignments, centred on Mohenjo Daro and Easter Island. The alignments that do not cross over Mohenjo Daro and Easter Island are curved because the perspective of this 3-D illustration is not centred along those lines. It’s a rather interesting assumption, and Nazca lines do have peculiar cross points. I cannot judge how trustworthy such hypothesis is. But taking into account that such cult sites as the Pyramids of Giza and Angkor were built by a star map, Nazca lines should bear direct relation to such map as well. This is another depiction of convergent alignments. 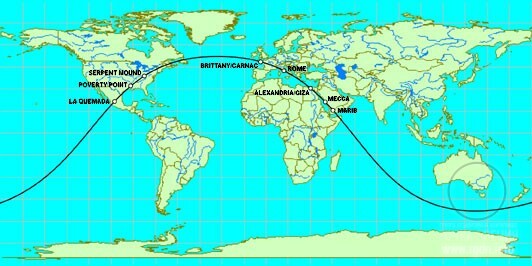 From left to right, the marked sites are Easter Island, Fatima, Rome, Siwa, Giza, Luxos, Mecca, and Mohenjo Daro. A total of six great circle alignments are shown on the diagram above. The diagram indicates as many as four alignments cross in two points. These are very interesting points which are antipodes. Great circles are straight lines that go all the way around the centre of the Earth and connect two points on the Earth’s surface at the shortest distance. For instance, the equator is a great circle. Meridians of longitude that cross over the north and south poles are also great circles. 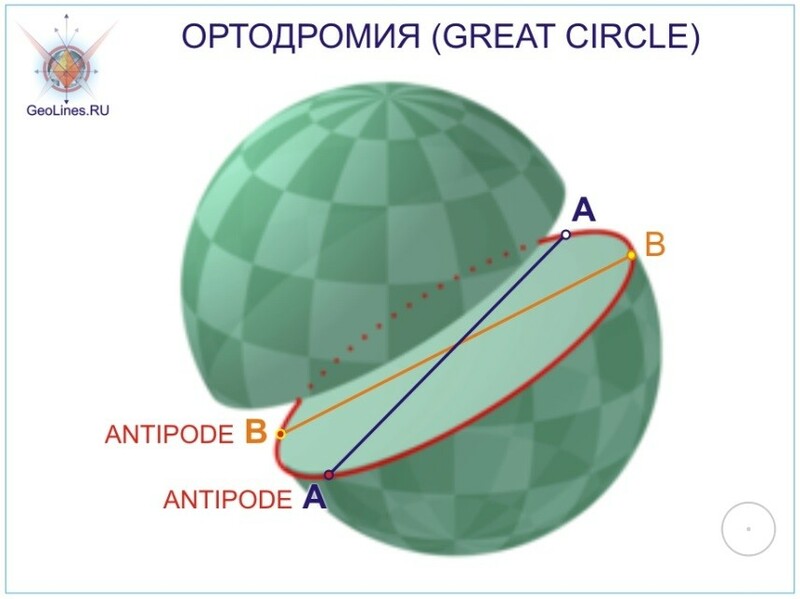 For every location on a great circle, its antipodal location is also on the circle. Other than the equator itself, any great circle crosses the equator at two antipodal locations, 180° apart. Recurring to our antipodal points in which the largest number of alignments crosses, these are Easter Island and Mohenjo Daro (the latter is used as a reference point, for the actual point is outside the city). I already touched upon the subject of Harappan Civilization, while Easter Island deserves separate consideration. Let me just remind in both cultures there were numerous identical hieroglyphs, despite the fact they were located on the opposite sides of the globe. There is another interesting fact about Mohenjo Daro. 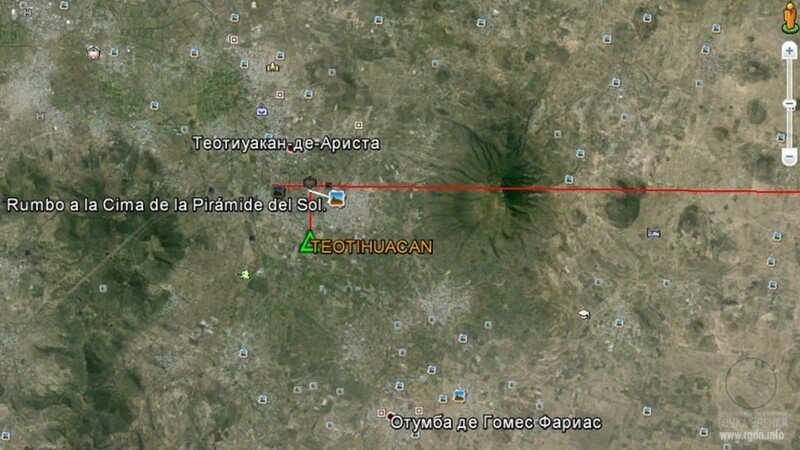 Teotihuacan Avenue of the Dead – the main road that starts at the Pyramid of the Moon: if we extend a line along the road, it will run through Mohenjo Daro. Literally translated from Sindhi language, the name Mohenjo Daro means the Mound of the Dead Men. Figures 1, 2, 3 show this line. Angkor Wat is 4,745 miles from the Great Pyramid and the Great Pyramid is 7,677 miles from Nazca. This is a precise expression of φ: 4,745 x 1.618 = 7,677. At that, Nazca divides the distance between the Great Pyramid and its antipode along the Great Pyramid – Easter Island line by the golden ratio as well, while Easter Island itself lies straight in the middle of this line, between Nazca and the Great Pyramid as its antipode, with a 0.3 degree error, i.e. 40 km. Ninety miles northeast of Angkor Wat are the Angkor temples at Prassat Preah Vihear. Preah Vihear is 4,754 miles from the Great Pyramid. The temple is located just 40 km away from the antipode of Nazca and correspondingly from the Great Pyramid – Easter Island line. Twenty five miles northwest of the city of Nazca is a figure known as the Hummingbird. 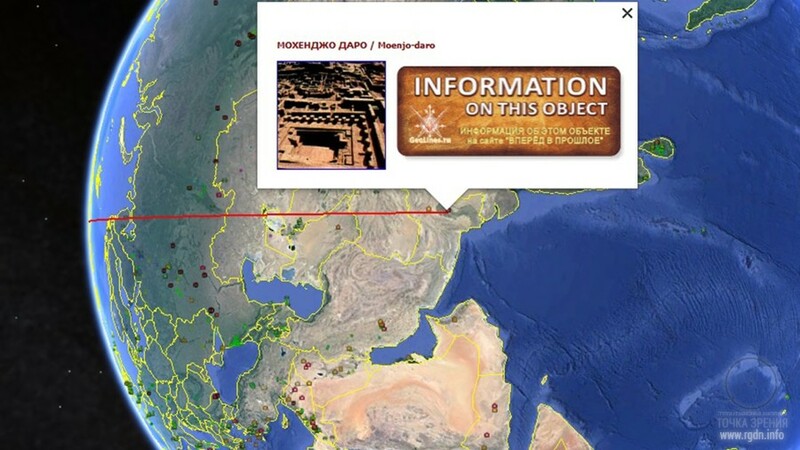 The Hummingbird is 7,692 miles from the Great Pyramid. The line of ancient sites also crosses over the Hummingbird. These Golden Section relationships may also be diagrammed on a straight line. 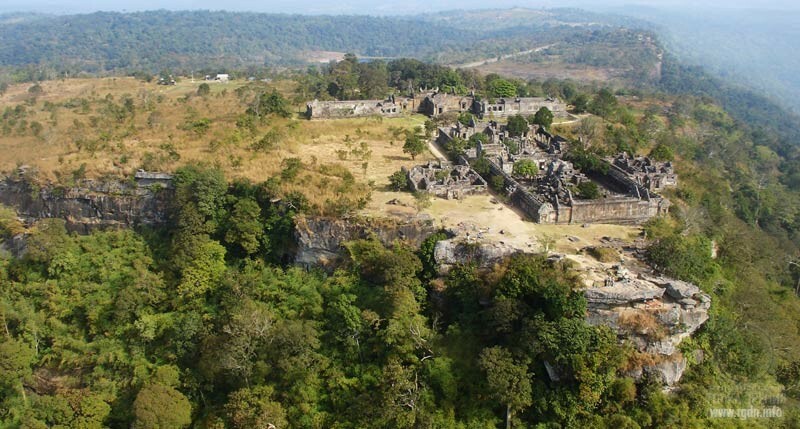 Preah Vihear is the Khmer Empire temple complex dedicated to lord Shiva. 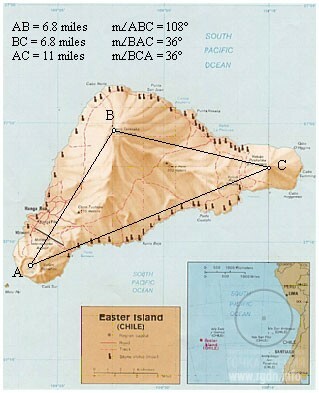 Easter Island is triangular and the three volcanic peaks on Easter form an isosceles triangle with an apex angle of 108° and base angles of 36°. The ratio between the length of the base and the lengths of the sides precisely expresses φ (6.8 miles x 1.618 = 11 miles). Let me remind where the angles of 108 and 36 degrees are found. The southern coastline is roughly parallel to the great circle (the Great Pyramid – Easter Island) as it crosses over the island. The southwestern corner of Easter is 10,060 miles from Giza. 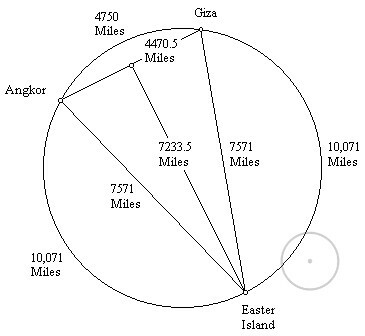 The length of the great circle segments from the axis point to Easter and to Giza is 6,218 miles. The ratio between the base length of 10,060 miles and the side lengths of 6,218 miles is also φ (6,218 x 1.618 = 10,060). The azimuth from the axis point to Giza is 9° and the azimuth from the axis point to Easter is 154°. The above image depicts Giza, Easter Island and the axis point. The circle radius is 6,218 miles. The azimuth from the axis point to Giza is 9° and the azimuth from the axis point to Easter is 154°. The angle of the terrestrial triangle at the axis point is 145°. The terrestrial angles at Easter and Giza are 90°. These terrestrial angles convert to flat surface angles of 108° at the axis point and 36° at Easter and Giza. This is the same triangle that is formed by the three volcanic peaks on Easter and the same triangle that is found in a pentagram. 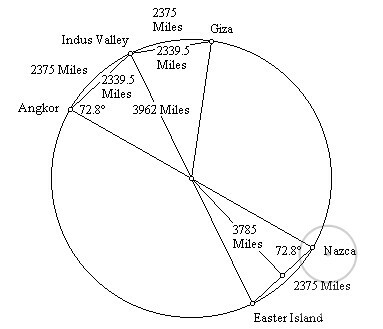 The great circle (the Great Pyramid – Easter Island) on which ancient sites are situated may be represented as a circle obtained upon section of the Earth with a plane. At that, all points would be located around the centre of the Earth. The centre of the circle is the centre of the Earth. The distance from the centre of the Earth to any point on the circle is the radius of the Earth (24,892 ÷ π ÷ 2 = 3,962 miles). In the picture we see marked Angkor, Mohenjo Daro, Giza, Nazca, andEaster Island. The point in the centre is the centre of the Earth. 3,962 miles is the Earth’s radius. As you can see, we get triangles with base angles of 72.8 degrees. Another triangle: Angkor, Giza, and Easter Island. 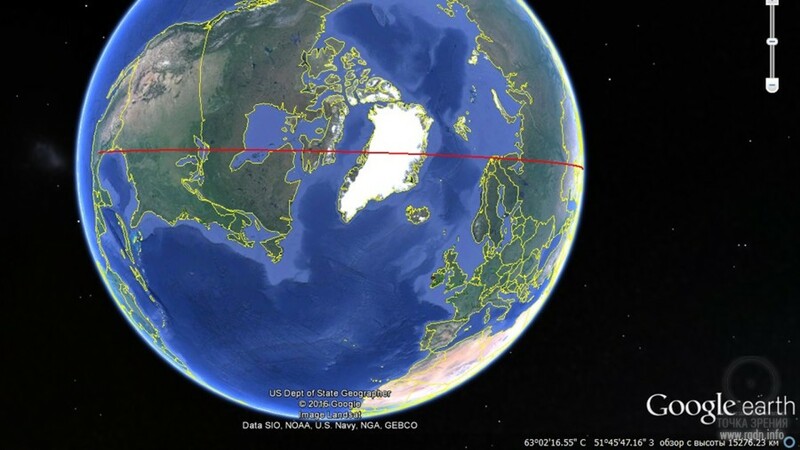 4,750 miles is the distance in circumference, 4,470.5 miles is the distance as if through the Earth. The base angles are again 72.8 degrees. The steps of this pyramid have been estimated to be inclined to the vertical in the range of 16°-18°. Recent measurements by Jon Bodsworth indicate a 17° angle of inclination. Measurements by Robert Bauval also indicate an angle of 17° with a margin of error of plus or minus 20'. 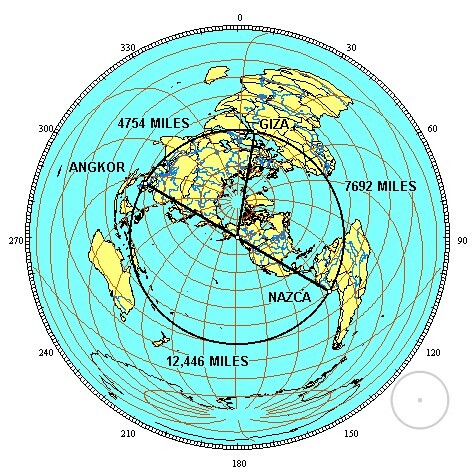 An inclination of 17.172° (17°10') to the vertical gives an inclination of 72.828° to the horizontal, the same as the through Earth terrestrial triangles shown above (formed by Easter Island, Nazca, Angkor, and Giza). The 2φ ratio between the base and the height of the right triangle formed by the inclination of the pyramid steps is the same as the 2φ ratio between the half-base and the height of the through Earth terrestrial triangles shown above. Let me remind this is exactly the Bauval who ascertained a correlation between the Orion’s Belt stars and the pyramids of Giza, the civil engineer “with a gift for astronomy” as he is referred to in various sources. As for me, I don’t see anything weird here, for a true engineer is the most inquisitive animal on the planet, and owing to such engineers great discoveries are often made. As the Earth rotates on its axis, the Equator remains aligned, but the line of ancient sites (the Great Pyramid – Easter Island) describes a sine wave as a result of its tilt relative to the Equator. The line of the ecliptic may be observed describing a similar wave by spinning a globe that has a line of the ecliptic. The wave may also be visualized by drawing the line of ancient sites on a flat projection of the Earth. The frequency of the wave is equal to the circumference of the Earth. The amplitude of this wave, measured from the middle of the wave (the equator), is 30° of latitude. Recall that the 30th parallels are ½ of the height of each hemisphere, or ½ of the radius of the Earth. Since the height of the wave is equal to ½ of the Earth’s radius, the ratio between the frequency of the wave and its amplitude is 4π. Measuring the amplitude from the top of the wavelength to the bottom (from 30° N to 30° S), the amplitude is equal to the radius of the Earth, and the ratio between the frequency and the amplitude is 2π. This is quite an interesting point that once again reflects connection between terrestrial objects and the starry sky. In his research Alison further touches upon the quest of Atlantis. Many people search for Atlantis, although the fact that we have to look for it, argue whether it existed or not, where it was, what kind of people populated it, what they were occupied with, which knowledge they possessed, and what happened to them eventually... well, all this was a mere reflection of their choice, no more than that. In 12-13 thousand years some researchers will probably discuss our current civilization in the same way: “Who were they? What knowledge did they have? What made their life? What happened to them?” And this will already be a reflection of our choice – the choice of every individual, of which the choice of the entire civilization emerges. Yet, another option is also possible by which future researchers will rapturously describe the time when people managed to change the vector of their civilization development from the material to the spiritual, having thus made an incredible leap in evolution and leaving it for their descendants along with fond memories of themselves. Returning to Alison’s research, I’d like to refer to one of the places where he believes Atlantis might be located (he actually has several assumptions as to the location). Another possible Atlantis location is halfway between the Great Pyramid and Easter Island, at 4°19' north latitude, 41°30' west longitude, under the Atlantic Ocean northeast of the mouth of the Amazon. 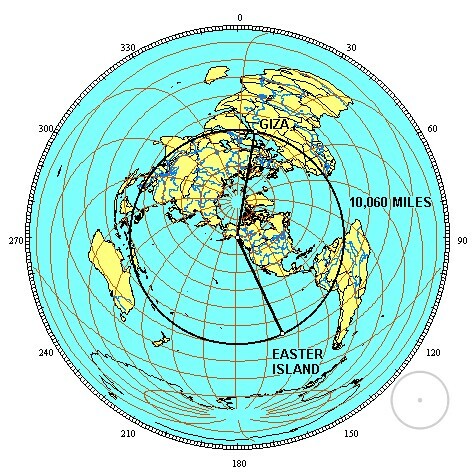 On the diagram below, the marked locations are Giza, Angkor, AnatomIsland, Easter Island, and 4°19' north latitude, 41°30' west longitude in the Atlantic Ocean. The distance from the Great Pyramid to Easter Island is approximately 40% of the circumference of the Earth. The marked location in the Atlantic is halfway between the two, 20% each way. Machu Picchu is halfway between Easter Island and the marked location in the Atlantic, 10% each way. The distance from the Great Pyramid to Angkor Wat is approximately 20% of the circumference, and the IndusValley (the antipode of Easter Island) is halfway between the two, 10% each way. The distance from Easter Island to Angkor Wat is approximately 40% of the circumference, and AnatomIsland is halfway between them, 20% each way. Although there are no islands in the Atlantic near 4°19' north latitude, 41°30' west longitude, it is interesting to note that the famous Piri Reis map shows a large island in this location, and the geology of recent core samples, taken from the ocean floor in this area, is of continental rather than oceanic type rock. 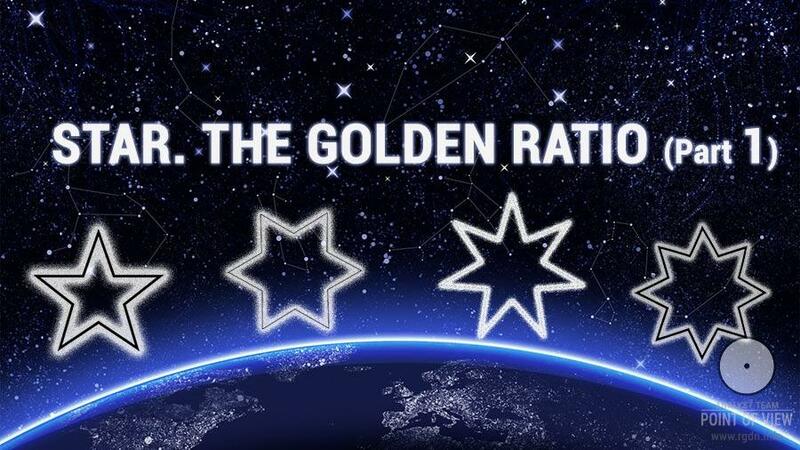 Let’s consider the five points of the star. Three points are well familiar to us: Giza, Easter Island, and Angkor. AnatomIsland prima facie seems to be no special place. Anatom (also known as Aneityum or Keamu) is the southernmost populated island in the new Republic of Vanuatu (formerly known as the New Hebrides) in the Pacific Ocean. Administratively it’s a part of Tafea province. AneityumIsland is of volcanic origin. Geologically it consists of two joined volcanoes that formed in the Pleistocene epoch. Volcanic activity in the island supposedly ended in the Holocen epoch. The area of the oval-shaped island is 159.2 km². Its highest peak Inrerou-Atamvan reaches the height of 852 m. The island is surrounded by coral reefs and banks, has a mountainous relief and is covered with dense rainforests. 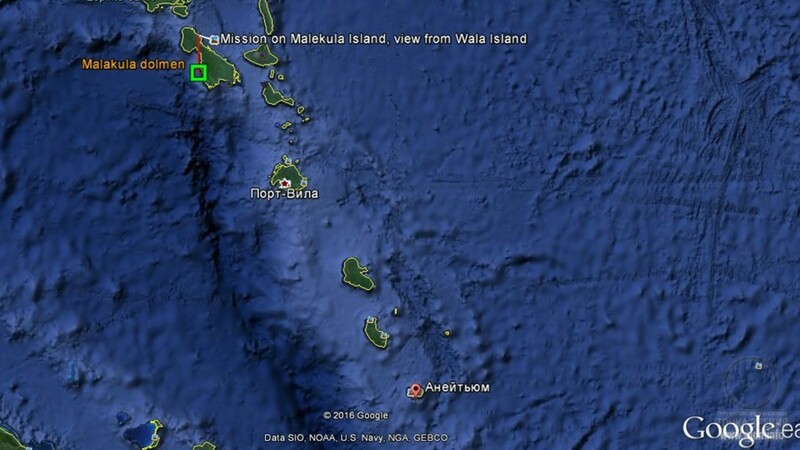 Northward of Anatom there is another island of the Republic of Vanuatu – the Malakula (Malekula) Island. Here’s a record about the island, made in 1972 by Alexander M. Kondratov (Soviet and Russian linguist, biologist and journalist). For instance, on the MalakulaIsland, which is a part of the New Hebrides archipelago, still several years ago natives erected… stone dolmens and menhirs similar to those built in the Mediterranean many millennia ago! Local legends say the first dolmen on Malakula was erected in honour of a mythical personage Kabat. That Kabat arrived from faraway seas and brought diverse knowledge to the island. As for the fifth point, it is in the ocean, although in that place an island could be situated in ancient times as mentioned above. 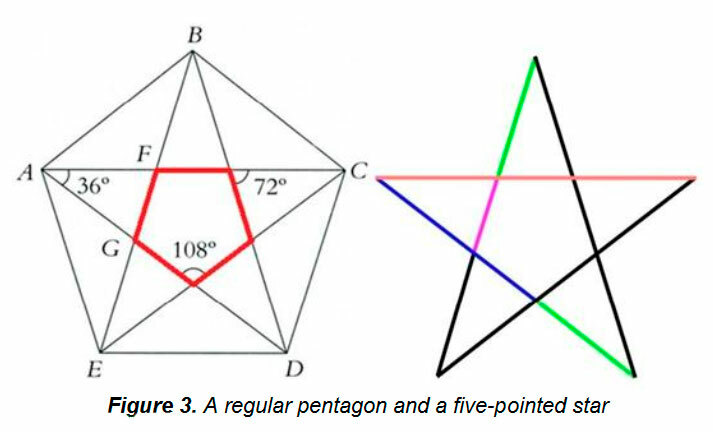 Even if we don’t take into account the last 2 points (Malakula is if fact at a considerable distance from Aneityum, while the last point rests against the ocean), the location of Giza, Angkor and Easter Island at the regular pentagon vertices (as parts of the IDSE system) or at the points of a star is still rather fascinating. Thus, I finish recounting Jim Alison’s work that is quite interesting in my opinion. Along with that I complete the entire article series dedicated to the star. 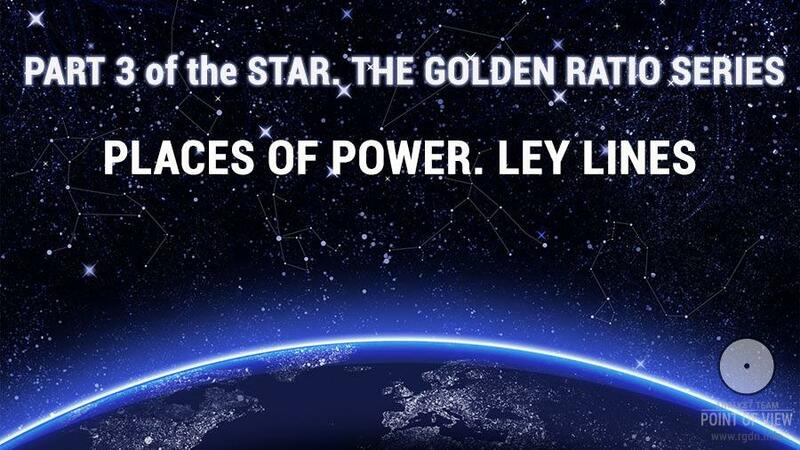 The star sign is interesting, first and foremost, because “it activates in a human being (at the subconscious level) a feeling of justice, hope for the future, and it also favours unification of people”. Certainly, unification is possible in different ways, and the uniting power of the sign can also be used to change governments and arrange revolutions (there are plenty of examples): one lord is replaced by another one, but have people started living better? Is there any sense in such unification…? Here, another interesting point is worth mentioning, namely the placement of churches in Karlsruhe: they are actually placed in ancient heathen cult sites and form a star sign. 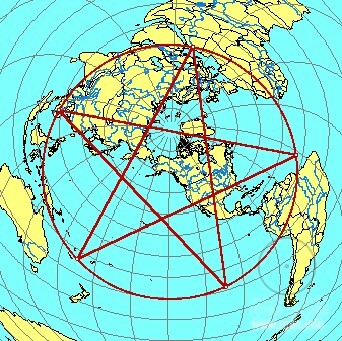 Various cult sites on the planet are located at vertices of a regular pentagon (at the points of a star). Numbers 72 and 108 are considered sacred, special numbers in beliefs and traditions of different peoples of the world. And these numbers are directly associated with the star (see Figure 3 above). According to the initial knowledge of Belyao Dzy science, a star is a symbol of the feminine divine principle, whereas a circle means existence, the Universe. A star in a circle means the presence of the feminine divine principle in the circle of existence. It should also be noted section of a sphere gives a circle (the so-called great circle was referred to several times above). We should only mark a star in a circle, and thus we display the presence of the feminine divine principle – depict ALLAT. At that, the sky is also a sphere (the celestial sphere), and its section again gives a circle at certain points of which we can also draw a star sign. Again we get ALLAT – the power that put everything in order in this world. And such celestial points may be projected to the Earth to represent ALLAT on the Earth. Furthermore, placement of cult sites in the form of a star sign that favours unification should prompt to future human generations for which purposes they actually should unite. Should their unity be based on material or rather spiritual priorities (?)... simply for the sake of making this world a little better, adding one’s own grain of love and kindness into this world for people around and for everyone living on this planet. In such case the Earth will in turn be kinder towards those who inhabit it. Let me finish the story with Rigden’s words (don’t ask me why I’ve chosen these particular words – it’s a mere chance, a random choice).